If you hear "Gemischter Satz" You may be tempted to say "God Bless You!" But the appropriate answer is "They're delicious, aren't they?" Gemischter Satz are special wines from Austria's capital city of Vienna. Made from a blend of white grapes that are grown together in the field, then picked and fermented at the same time, there was a point not too long ago when the mania for "single varietal" bottlings threatened this age-old tradition of Austrian field blends. Happily, the tradition was maintained, the grapes remained planted in gloriously mixed vineyards of Gruner Veltliner, Weissburgunder, Riesling, Muscat Ottonel, and other grapes. Few Gemischter Satz bottlings specify the grapes within, and none that I've seen can give you varietal percentages. Don't worry--go for it. 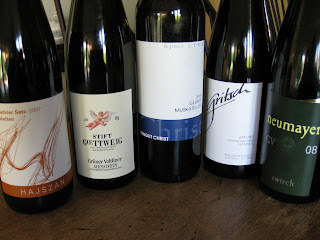 I'm a relative newbie to the wines of Austria, but I can't recommend Gemischter Satz highly enough. If you enjoy crisp, food-friendly whites--and are a bit tired of the same-old same-old that you've been drinking lately seek out one of these wines and perk up your tired tastebuds. 2008 Weingut Rotes Haus Gemischter Satz Classic Nußberg ($20) This tasted very much of a Gruner Veltliner to me, with its white pepper, salt, and grapefruit aromas. The flavors of apple, grapefruit, and pepper confirmed my initial impression and the aftertaste was interesting--like sour apples. Very good QPR. 2007 Weingut Hajszan Gemischter Satz Weissleiten ($18) This stunning organic and biodynamic wine had unmistakable aromas of freshly ground black pepper, with floral notes. The flavors turned melony, with a zing of quince, and remained dry and refreshing. The juicy, lively aftertaste kept you reaching for the bottle. This is the kind of wine that invites you to spend the evening with it, discovering the flavors that are magically contained within it. Excellent QPR. 2008 Weingut Christ Wiener Gemischter Satz ($16) This wine had piercing aromas of apple, salt, and lemon. The flavors are equally intense, with loads of minerality and stone to accompany the slightly bitter lemon at its core. A fresh and citrusy wine. Excellent QPR. 2008 Zahel Gemischter Satz Schloss Schönbrunn (NA as of yet in the US) This restrained, elegant wine had faint aromas of lemon and peach. Dry flavors reminiscent of Meyer lemon dominate the palate, and there is a touch of bitter orange follows in the aftertaste. Well worth seeking out--and I hope an American retailer snaps this up. Note: I've been sent some corrections and have made them in the body of the text above. The wines themselves all come from within the city limits of Vienna, and Weingut Hajszan's wine is certified organic and biodynamic. Also, if you are looking for these wines, retailers are popping up in the comments to say they have these sometimes-hard-to-find bottlings. So check below if you are interested in purchasing, as the usual online wine search engines are not always exhaustive. This month I've been getting to know the red wines of Calabria--and they've surprised me. When I mentioned Calabrian wine to most people--even Calabrians!--they scoffed at the quality of wine produced in this region of Italy. But I liked the rusty funkiness, the fruitiness, and the great value that I found in the wines I tasted. And though these wines came from southern Italy, they reminded me of French wines from Burgundy and the Beaujolais. 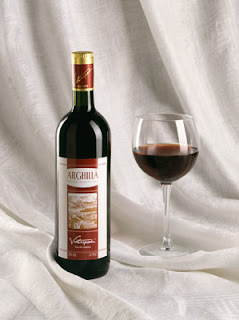 Take the 2004 Vintripodi Arghillà ($19.99, Wine Expo) This wine, a blend of Nerello Calabrese and Alicante, has the certain funky pungency that is characteristic in my (limited) experience of Nerello, and reminds me of a good Beaujolais. The wine showed some tawny edges around the dark purple juice at the center of my glass. The aromas were of sour cherry, earth, and funk and the flavors followed suit. This was certainly not a boring, same-old red and I think it would go just as brilliantly with stews as it did with our pasta dinner. The other Calabrian wine I tried was the 2006 Ippolito Cirò Liber Pater ($17.99, Wine Expo; available elsewhere for $17). Made with a native Calabrian grape called Gaglioppo, I wasn't familiar enough with the variety to know what to expect. What I discovered was a wine that was nicely poised between a Pinot Noir and a Nebbiolo in terms of flavor and style. There were minty, brandied, and currant aromas. Following up were leather, plum, and currant flavors with a long, savory finish with notes of soy sauce. The juxtaposition of the berried, herbal aromas and the savory qualities of the flavors was intriguing and made this wine memorable. Some may raise their eyebrows at Calabrian wine, but you won't catch me doing it. Give a Calabrian wine a try. They were a delightful surprise as I wrap up my journey through Italian wines. 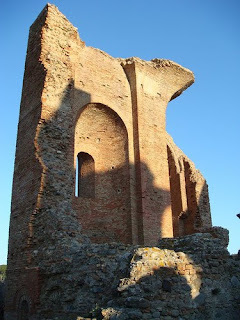 All that's left is Emilia-Romagna--and we'll head there in November. dations for some affordable bottles (and one splurge-worthy one, too) that are just perfect for this time of year. Austrian wines have an earthiness that makes them a great partner for squash, pumpkin, turkey, sage--so many of the foods and flavors we're all enjoying this time of year. Autumn doesn't just mean it's time to pop open the red wines--there's still plenty of occasions that call out for a white. I'll have more posts on Austrian wines next week. I was favorably impressed by what I sipped, and think you will be, too. Have a great weekend, and get out and do some wine exploring. Find yourself an Austrian wine to try. And if you've already found one (or two, or three...) be sure to let us know in the comments below or over on Serious Eats. Calabria is the toe of Italy's boot--and to me it always looks like Calabria is preparing to kick Sicily straight up into Spain. 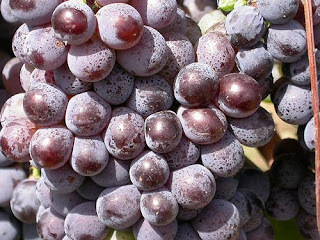 As a southern Italian region, Calabria is home to rustic red wines, many of them made with the native Gaglioppo grape. 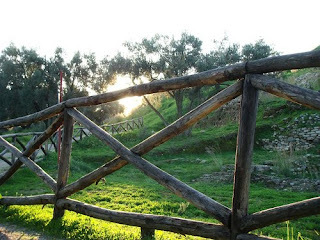 Have you experienced Calabrian wine? 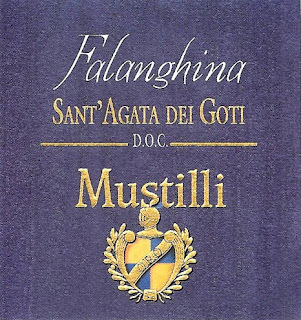 And do you have any specific tips or recommendations to share about the wines of this region? Has anyone out there had a Calabrian white, and if so did you drink it in Italy, or find it over here in the US? These past three years have been an amazing journey. I've become a better writer, I think I've become a better teacher in my day job, and I've learned a lot about wine. I've also had the opportunity to meet up with readers, bloggers, and winemakers all over the world--which is, perhaps, the thing that has brought me the most enjoyment. As we move into the fourth year, you may notice some changes. 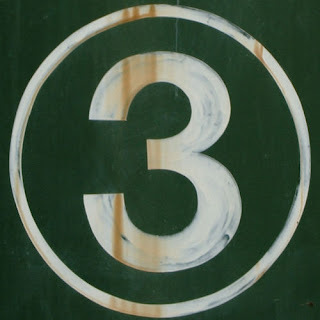 I'm trying to focus on quality posts, rather than quantity, while juggling other demands. Rather than stop blogging, I'm cutting back and you may see fewer posts, posts that cover more than one wine (like the Pinot Noir and Chardonnay posts from last week), and more posts that cover the magical mixing of wine and food. To everyone reading this and all my subscribers who receive my notes on wine through their RSS Readers, email, and other services--thank you. Here's to another great year. In this week's Serious Grape column, my weekly contribution to the fabulous food site Serious Eats, I try to demystify the subject of decanting. 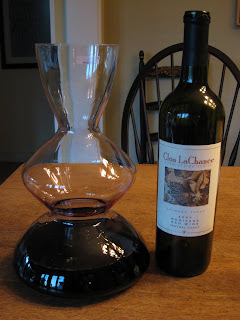 Basically there are two reasons to decant: to remove the sediment from old wines and to aerate younger wines. In both cases, decanting makes good wine taste better. Last night, a friend was pouring some lovely old wines including a 1997 Château Léoville Barton that was just drinking beautifully--but had some sediment in the bottle as a result of its age. Decanting got that sediment out of there, which would have given the wine a bitter, tannin taste as well as negatively impacting the texture. So don't be intimidated or overwhelmed by decanting. You can do it with a clean mayonnaise jar if you want, and there are some stylish options like the one pictured here, too. Head over to Serious Grape and check it out.